When was the last time you got a song stuck in your head? Perhaps it was the last song you heard on the radio, or maybe it was a tune your child was singing for you. Maybe it was that annoying little ditty from your last Disney World vacation. Music impacts people in many different ways. Did you know it can also be used to help children learn better in school? 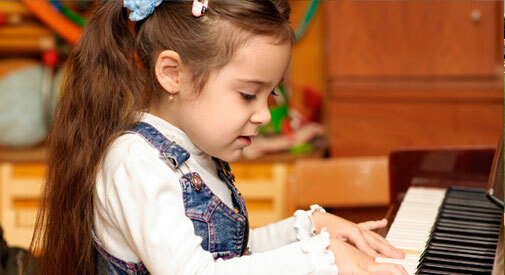 The role of music in the educational environment has traditionally consisted of teaching the basics. In elementary school, children have music class or a segment during the day where they learn songs and sing together in an unstructured fashion. In middle school, they start singing in harmony or playing an instrument in the band or orchestra. By the time they reach high school, they are fairly competent and are able to show off their progress and skill during several concerts throughout the school year. While this is a great start, we now know that music, when used properly, provides much more in the way of benefits to students. Music teaches more than just tunes and notes on a page. When children engage in music, they’re activating three areas of the brain at once: language, hearing, and rhythmic motor control. The combination of these three entities teaches coordination and improves mental acuity. Using music in the classroom also improves retention; by putting lesson elements into a musical format, students are better able to learn and remember the concepts they’re being taught. Emotions are deeply tied to music. Tapping into the emotion behind the music teaches kids to experience a wide range of emotion themselves. It also teaches empathy; by engaging with what the songwriter or performer is feeling, students learn through music to connect with others. Music can also be used as therapy. Music therapy, as defined by Wikipedia, is “an interpersonal process in which a trained music therapist uses music and all of its facets—physical, emotional, mental, social, aesthetic, and spiritual—to help clients to improve or maintain their health.” Research has shown music therapy to be beneficial in improving all types of conditions, both physical and mental, including Down syndrome, dyslexia, and attention deficit hyperactive disorder (ADHD), to name a few. Music therapy differs from the traditional music program by using music to create a more all-encompassing experience for the student, one which incorporates the simultaneous use of many of the student’s faculties, such as communication, cognitive ability, gross motor skills, and emotional health. Introducing music therapy into the educational environment needs to be done correctly in order to be most effective. The availability of a good music therapist is critical; he or she can provide advice on the best way to incorporate the program into the existing environment. In addition, for the program to be the most effective, a separate, dedicated music therapy room should be set up. A music therapy room differs from a traditional music room in that the space should be big enough to accommodate several different musical instruments, including large instruments. It should include enough storage cabinets so that the instruments can be stored out of sight when not in use; some students may be distracted during their session by instruments left sitting around the room. The acoustics in the room should include soundproofing material so that loud instruments can be played without bothering neighboring classrooms. Music provides many benefits to students, both on its own, and when used as a method of therapy for students with special needs. It teaches students how to work together in larger groups, strengthens their self-worth, and improves focus and memory. Incorporating music into the school curriculum will benefit everyone: students, teachers, and administrators alike. Rock on!